14-15 November 2002 1 Scientific Committee on Antarctic Research (SCAR) Liaison Report to ISO/TC 211 by Mr. A. Paul R. Cooper SCAR appointed liaison to. 2 14-15 November 2002 2 Background Paul Cooper has been involved in Antarctica mapping projects since 1979 and is currently Geographic Information Systems Manager at the British Antarctic Survey in Cambridge, England. Among the many roles for SCAR is to coordinate the acquisition and dissemination of geographic information through the Geoscience Standing Scientific Group (GSSG). 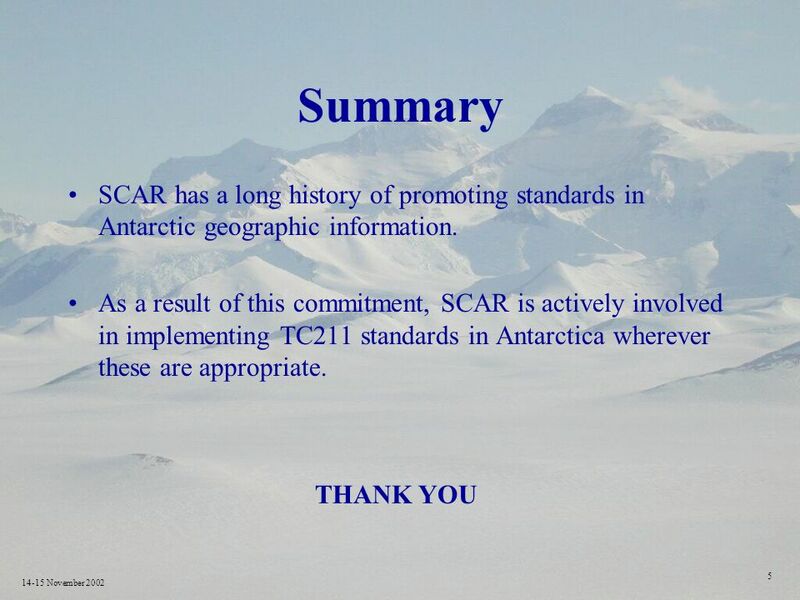 SCAR has promulgated cartographic standards for use in Antarctica since 1961. As Antarctica is mapped by agencies in many nations, the use of and adherence to agreed international standards is of obvious value to all those who work on this continent. Since 1996 the adoption and use of TC211 standards for geographic data has been encouraged. 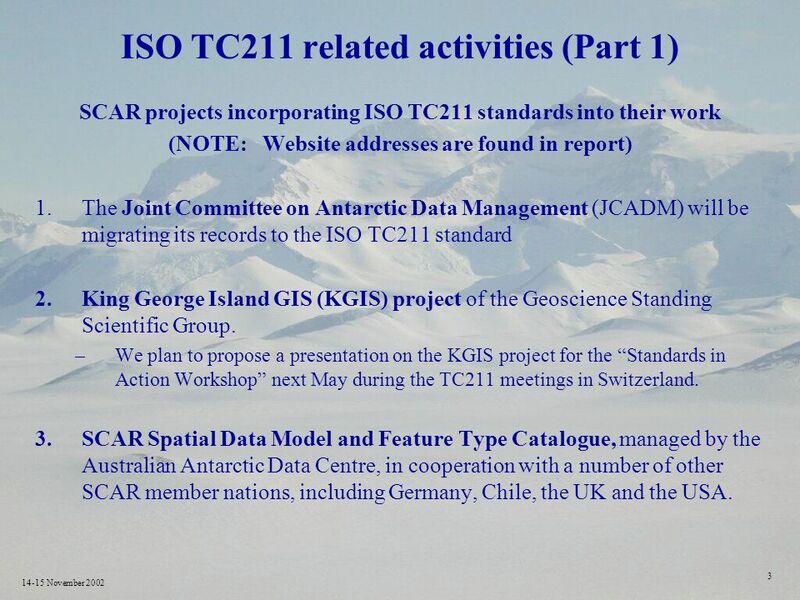 3 14-15 November 2002 3 ISO TC211 related activities (Part 1) SCAR projects incorporating ISO TC211 standards into their work (NOTE: Website addresses are found in report) 1.The Joint Committee on Antarctic Data Management (JCADM) will be migrating its records to the ISO TC211 standard 2.King George Island GIS (KGIS) project of the Geoscience Standing Scientific Group. –We plan to propose a presentation on the KGIS project for the Standards in Action Workshop next May during the TC211 meetings in Switzerland. 3.SCAR Spatial Data Model and Feature Type Catalogue, managed by the Australian Antarctic Data Centre, in cooperation with a number of other SCAR member nations, including Germany, Chile, the UK and the USA. 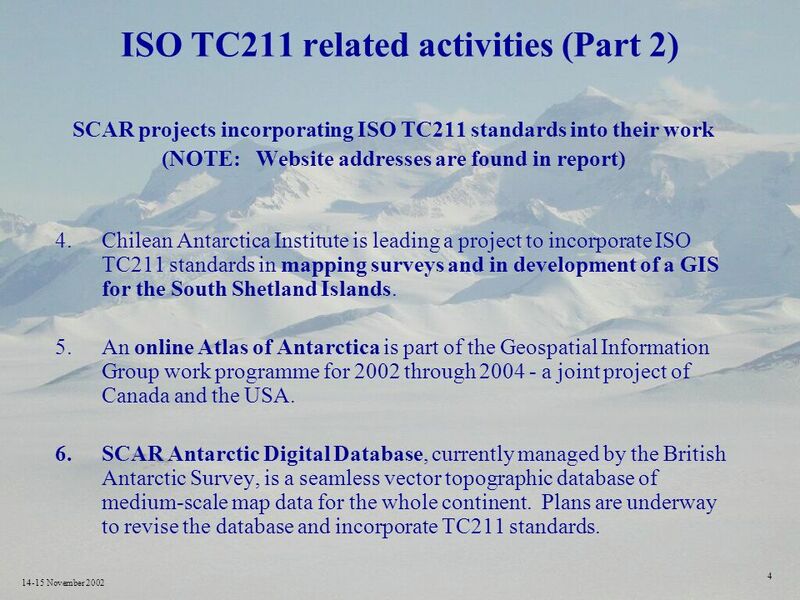 4 14-15 November 2002 4 ISO TC211 related activities (Part 2) SCAR projects incorporating ISO TC211 standards into their work (NOTE: Website addresses are found in report) 4.Chilean Antarctica Institute is leading a project to incorporate ISO TC211 standards in mapping surveys and in development of a GIS for the South Shetland Islands. 5.An online Atlas of Antarctica is part of the Geospatial Information Group work programme for 2002 through 2004 - a joint project of Canada and the USA. 6.SCAR Antarctic Digital Database, currently managed by the British Antarctic Survey, is a seamless vector topographic database of medium-scale map data for the whole continent. Plans are underway to revise the database and incorporate TC211 standards. 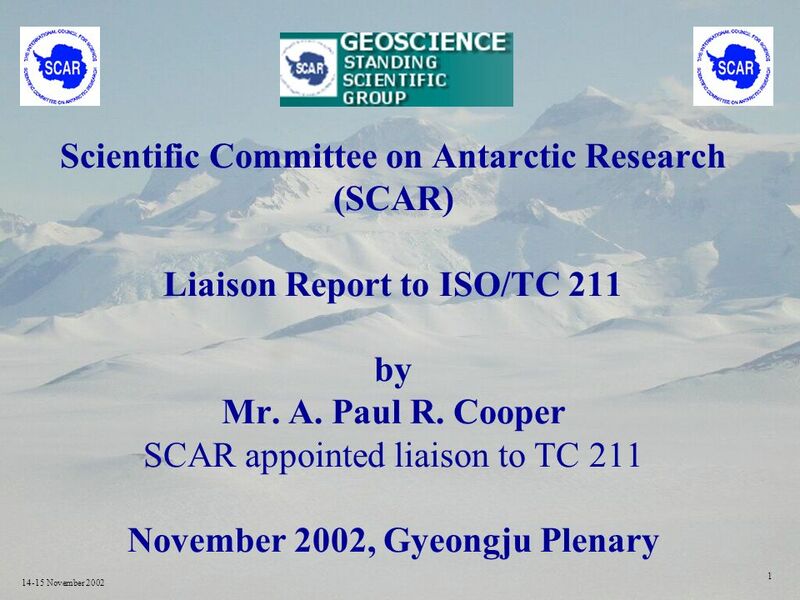 Download ppt "14-15 November 2002 1 Scientific Committee on Antarctic Research (SCAR) Liaison Report to ISO/TC 211 by Mr. A. Paul R. Cooper SCAR appointed liaison to." SITAD 23/06/06 Luigi Garretti, Silvana Griffa, Roberta Lucà EC-GI & GIS Workshop Roberta Lucà CSI- Piemonte SITAD: from a regional SDI to a model for delivering. Status Report XVII. SCAR, Shanghai, July 2002 Steffen Vogt IPG University of Freiburg Status Report XVII. SCAR, Shanghai, July 2002 Steffen Vogt IPG University. The Cybercartographic Atlas of Antarctica Contribution from Wuhan University, China Dongcheng, E., Nengcheng, C.
The Cybercartographic Atlas of Antarctica D.R.F. Taylor Carleton University SCAR WG-GGI (Canada) XXVII SCAR, Shanghai, PRC July 2002. The SCAR Standing Committee on Antarctic Data Management (SC-ADM) New directions in Antarctic data management Taco de Bruin – NIOZ Royal Netherlands Institute. Antarctic Spatial Data Infrastructure My Vision Article III.1.c of the Treaty XXIII ATCM Resolution 4 (98) Recommend That. Scientific Committee on Antarctic Research Meeting Goals & Structure Amsterdam 7 th September 2009. AAA and SCADM Helen Campbell (presented by Phil Anderson) SCAR Standing Committee on Antarctic Data Management (SCADM) SCAR Standing Committee on Antarctic. Standing Science Group on Geosciences ~72 members and participants 25 projects Place names Plate tectonics Chief Officer: Philip OBrien - Australia Deputy. SCAGI Community Projects SCAR map catalogue Total 5850 maps - 26 countries 767 digital maps (722 Australia) UK 801 Argentina 97 Uruguay 2 Poland 1 France. Geomatica 2007 Workshop on Marine/Hydrographic Spatial Data InfrastructureWorkshop on Marine/Hydrographic Spatial Data Infrastructure The IHO Responding. 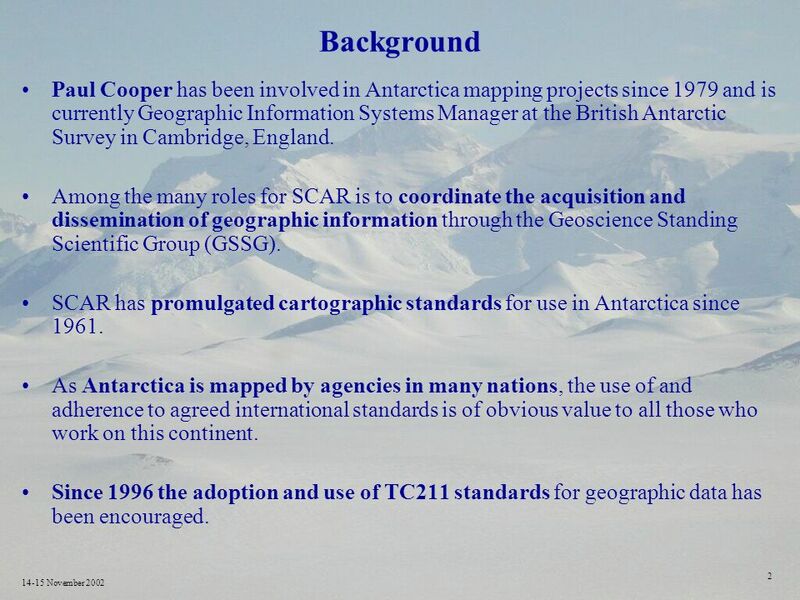 SCAR / SC-AGI Standing Committee On Antarctic Geographic Information First formed 1958 – WG on Cartography First formed 1958 – WG on Cartography Various.